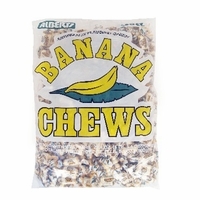 Alberts banana fruit chews. These bite size taffy have a great banana flavor perfect for anyone who loves banana candies. These are perfect for party favor bags, placing in your candy dish, filling pinata's or any thing else you may need smaller candy treats like parade candies. For those who really enjoy banana candy we have a few others you may be interested in. Check out our Banana French Chew, Bonomo Turkish Taffy or everyone's favorite Banana Laffy Taffy. We even have Bubbaloo Banana Gum , A banana flavored bubble gum with a liquid center. Each bag of fruit chews has 240 pieces.